Topic: How can I repeat these transformations/animations in RenPy? How can I repeat these transformations/animations in RenPy? Here is the poll for voting on who this game's love interest is going to be! It will be running over the next few days, and then after that I'll be diving headfirst into development. Hey everyone! The poll starts tomorrow, once the current one concludes, but in the meantime, check this out! 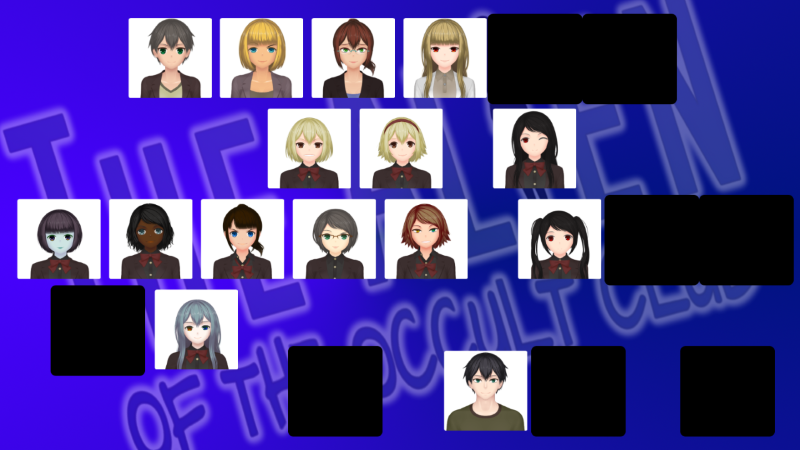 Want to get to know the cast of The Alien of the Occult Club? Well now you can! ... well, most of them, anyway. That's right- This is what TAOTOC's cast looks like, if you want to get a nice look. Pretty neat, huh? Hello, everyone! TAOTOC is now on version 0.03311! I've discussed some of the specifics here on itch.io, where you can find downloads for Windows, Mac, and Linux! These look incredible! Seriously, you have absolutely nailed the style. Great work. Hello, and Happy New Year('s Eve) everyone! I've updated the thread title a bit, but more importantly, I've posted a post on my blog talking about this past year in development and some of what I'm hoping for in the year to come. I hope you'll check it out! It's that time again, everyone! The latest version of TAOTOC is now available for Windows, Mac, and Linux. This version brings a lot of new things to the table (meaning a lot of room for new bugs, welp! ), so as always, please let me know if you catch anything off about it! Thank you so much! Hey again, everyone! The game's gotten another hefty update as of last night. There's an overhauled introduction, new backgrounds, some CGs (of sorts), and more! Hopefully by the next update, we'll have progressed a bit more, but I'm pretty happy with this one all the same. Until next time! Version 0.03211 has gone up this evening! Mainly addresses some bugs I've been made aware of, though there is also some new story content to enjoy as well. If you catch anything, let me know! Thanks!